Greg Stauffer is industrial projects coordinator, ESAB Welding and Cutting Products; www.esabna.com. The simplest wire feeders for arc welding control wire-feed speed (WFS), voltage, wire inch (to feed the wire forward while it remains electrically cold) and gas purge (to remove atmosphere from the gas-metal-arc-welding (GMAW) gun before welding). There’s a time and place for the simplest feeders—usually for operations with highly experienced welders. Coupled with the need for continuous cost reduction and quality improvements, most fabricators can benefit from newer wire feeders and controls that offer advanced functions. Here we describe some of those functions, and how to best use them in the shop. Creep start, when enabled, reduces WFS to some percentage of the value set on the control. Some feeders have an on/off function for creep start, where others are adjustable. After the control senses an arc, it ramps up WFS to the set value to produce a smooth, positive arc start. Creep start especially benefits welding with smaller-diameter wires and when using the short-circuit GMAW process, performed with relatively low voltage. If the cold wire drives into a cold plate at high speed, the arc may stumble and pop during arc initiation. Not only does this produce spatter or “cat whiskers” of unmelted wire that need manual removal, it could lead to incomplete fusion at the start of the weld. Creep start avoids this, and also benefits GMAW of aluminum—because it gives the arc time to burn through the layer of aluminum oxide, which melts at a higher temperature than does the aluminum itself. Large balls of weld metal on the end of a small-diameter wire cause stumbling during arc starts. With, for example, welding parameters set for a 0.035-in.-dia. wire, the welding power source does not “know” that it must provide enough power to melt a 0.070-in. ball. When the end of the wire dead-shorts into the plate, the power source will reach for all of the output it can muster in an effort to clear the short. The result often is a 1-in. flaming baton of wire—and, paying someone to grind it off later. The control panel of a next-generation GMAW weld-wire feeder provides access to a full suite of advanced functions that improve profitability. The less skilled the workforce, the more essential these functions become. Short-circuit termination (SCT) provides a small burst of power when the weld is terminated. This removes the molten ball and sharpens the wire tip. The operator can actually hear a little “phhht” sound of the wire sharpening. However, for SCT to function properly, the control must sense arc voltage. In a semiautomatic operation, the operator must keep the welding gun in position after breaking the arc. Unfortunately, because some wire feeders do not offer burnback control, a generation of operators learned to pull the gun away as they let go of the trigger. They then are required to snip off the excess wire sticking out of the gun. In many applications, the average weld is 2 to 3 in. long. Based on the author’s own time studies, operators can spend an equal amount of time clipping the wire and preparing to weld as they do actually welding. Functions such as SCT can greatly reduce cycle time, but only if operators train themselves to keep the gun in place for at least 1 sec. after releasing the trigger. Wire stickout is the amount of wire protruding past the end of the contact tip (not the gas nozzle as is sometimes assumed). The proper stickout for good arc initiation is about 3⁄8 in. with solid wire. To achieve good stickout without clipping the wire, the burnback control on the wire feeder stops the motor but keeps the power-source contactor engaged for an adjustable amount of time. This allows the wire to burn back after the operator releases the welding-gun trigger. Note that excess control causes the wire to burn back into the contact tip, where insufficient control can cause the wire to stick and freeze in the weld puddle. High-end applications, especially automated setups, demand positive arcs and weld terminations because they are more prone to weld defects (such as cold lap and crater cracking, respectively). When standard start and stop routines do not deliver the desired performance, look for a high-end control with special arc-start and -stop routines. For stop routines, look for a crater-fill function—crater filling is most important on aluminum alloys. With aluminum, the weld puddle cools much faster than does the base material, because it has a smaller mass. A stop routine that adds filler metal while ramping down welding parameters can help address crater issues. With some controllers, routines are programmed and selected much the same way a synergic line is selected or simply toggled on or off. Other wire-feed controls enable the user to fine-tune routines by adjusting start/stop voltage, current, WFS and duration. 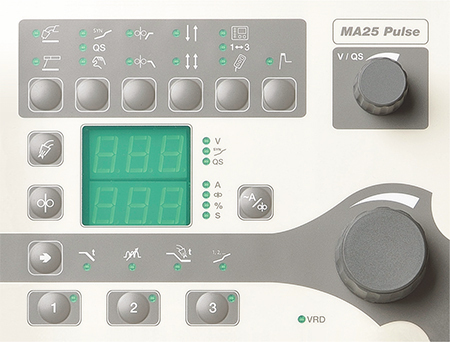 Finally, in the case of pulsed GMAW, peak current, background current and frequency also are adjustable. Hot-start routines are popular because the added energy when starting a weld can prevent poor fusion. Bottom line: End-users of advanced wire feeders and controls can nearly eliminate post-weld activity to compensate for poor arc starts and stops. Advanced wire feeders and integrated welding systems with advanced controls provide the ability to adjust GMAW inductance to help reduce spatter and adjust and enhance wetting action. Gas doesn’t just shield the weld puddle from the atmosphere; it greatly influences arc performance, helps cool the weld puddle and extends consumable life. Factory-default wire-feeder settings for shielding-gas control tend to work well for most mild-steel applications. Some operators prefer to add 1 or 2 sec. of gas-preflow time when welding aluminum, as well as on other applications if they notice porosity at the start of the weld. On aluminum and stainless steel, extending post-flow time helps cool the weld puddle and prevent cracking. Of course, operators must keep the GMAW gun in place after breaking the arc to provide adequate gas coverage. Some wire-feed systems enable two basic modes of operation. The standard mode, called 2-stroke or 2T in some systems, means that pressing the welding-gun trigger starts the welding process, and releasing the trigger ends the process. In applications with long welds, hand fatigue can result. The 4T (or 4-stroke or trigger lock) function enables the operator to release the gun trigger and keep the contactor engaged. To break the arc, the operator presses and releases the trigger a second time. …works with the short-circuit GMAW process to help reduce spatter and control puddle fluidity. With short-circuit GMAW, the arc turns on and off perhaps 150 times/sec. As the wire dead-shorts into the plate, voltage reaches zero; the current then rises to clear the short and the voltage rises as the arc becomes established. 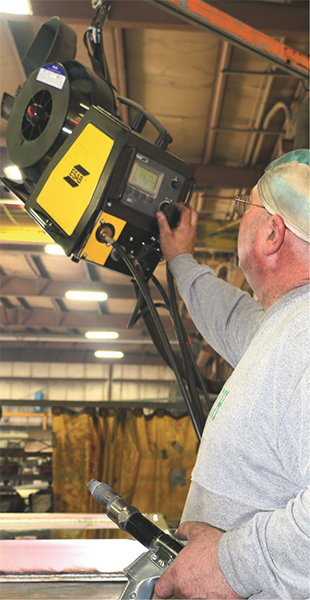 Wire feeders that offer one-knob synergic control allows welders to easily fine-tune the arc. Inductance controls the rate of rise of short-circuit current. The rate can be slowed so that the short may clear with minimum spatter. Inductance also stores energy and then supplies this energy to the arc after the short has cleared, to create a longer arc. Inductance also increases the amount of arc-on time. This, in turn, makes the puddle more fluid, resulting in a flatter, smoother weld bead and perhaps better tie-in at the toes of the weld. The opposite is true when inductance is decreased. When using solid mild-steel weld wire, use inductance to help control spatter. Generally, use higher inductance values with thicker workpieces and lower inductance on thin work. Solid stainless-steel wires are notorious for creating weld beads with a high crown and ropey bead appearance. Here, a longer arc-on time improves wet-out, flattens the crown and enhances bead aesthetics. 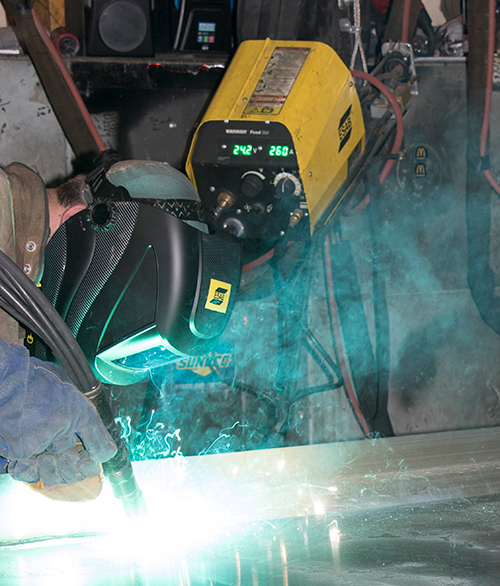 In job shops, welding operations differ from day to day. Each new job requires setup time and parameter testing. In large operations, manufacturers want all operators across all shifts and all plants to produce consistent results. While very different, both types of companies will benefit from a wire feeder/ controller that offers a programmable memory function, or a synergic machine. Programmable memory can feature varying degrees of sophistication, from enabling a user to set and recall parameters to providing parameter-adjustment limits. Either way, being able to recall parameters can save hours of setup time and more than a few pounds of scrap depositing test welds. Synergic lines come with programmed parameters established by factory technicians to deliver optimum results for specific combinations of wire type and diameter, welding process and shielding-gas composition. They also include preset values for creep start, burnback and the other functions noted above; these functions can be toggled on or off in some systems, and they can be adjusted in others. 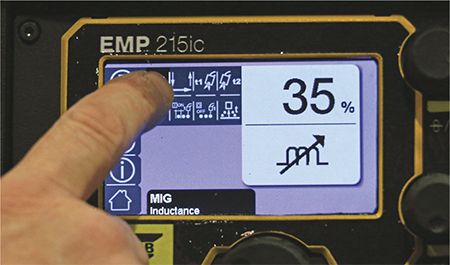 Several control panels enable one-knob synergic control and will automatically adjust all welding parameters, including those for pulsed welding. Basically, the welder turns the knob one way to weld hotter and faster and the other way to weld slower and cooler. Further, when a welding engineer has determined that a part needs a 1⁄4-in. fillet weld, for example, using particular voltage and WFS settings, synergic controls enable parameter limits—operators can spin the knob all they want and they won’t weld out of spec. Further, to obtain good results, operators need only focus on GMAW-gun mechanics. While called different names among systems and manufacturers, quick set and smart GMAW functions take performance beyond that of a synergic line. After engaging the quick-set function, the wire feeder will automatically select the optimal short-circuit frequency for the wire/gas combination used. The operator makes a short test weld, and in about 3 to 6 sec. the machine will automatically fine-tune performance. The operator will actually hear the arc as it adjusts to that perfect “sizzling-bacon” sound of the short-circuit GMAW process, with spatter minimized. Great article I think the advancement in STC are certainly exciting. What are the current parameters for programmable memory?